A hedge fund recently made news by securitizing its LP units as Ethereum-based tokens and selling them as tradeable (thereby liquid) assets. This brings technology to the VC industry that should truly challenge the extant VCs right? Well, yes and no. You see, the tokenized thingy is cool and all, but it really doesn't take full advantage of the technology at hand. After all, 2.5% & 25% is a pretty steep fee. Veritaseum, in anticipation of its upcoming ICO (online road show and executive summary ), is prepping to launch what we call an ICODAO, and Distributed Autonomous Organization that collects Initial Coin Offerings. We are attempting to make this nearly completely autonomous, tested (don't think "TheDAO" debacle, and considerably cheaper than hedge funds that you see these days. Now, the ICODAO is not a hedge fund, or a fund of any kind. It's sort of an autonomous software entity, that uses our software token, "Veritas" to allow other entities and individuals to gain access to its accumulated exposures and services. Those services are basically the sniffing our and collecting the best of the best ICOs and token offerings available, and the exposures are the natural result of the collection and holding of said ICOs. A world class research team will supply the analytical chops (click here if you don't know, the same team that predicted Bear Stearns, Lehman, CRE and housing crash, Google, EU sovereign debt crisis, etc.). Back to that in a minute, let's look at what's happening in the world off(block)chain. Yale University, one of the most-watched and best-performing college endowments, defended the fees it pays to external managers, saying in an annual investment report that a low-cost passive strategy would have “shortchanged’’ the Ivy League school’s students and faculty. Fees for private equity and hedge fund managers, some of whom command 2 percent for management and 20 percent for performance, or even more, have become a heated topic. Berkshire Hathaway Inc.’s Warren Buffett and writer Malcolm Gladwell have taken public shots at the structure, and Gladwell specifically targeted Yale two years ago. 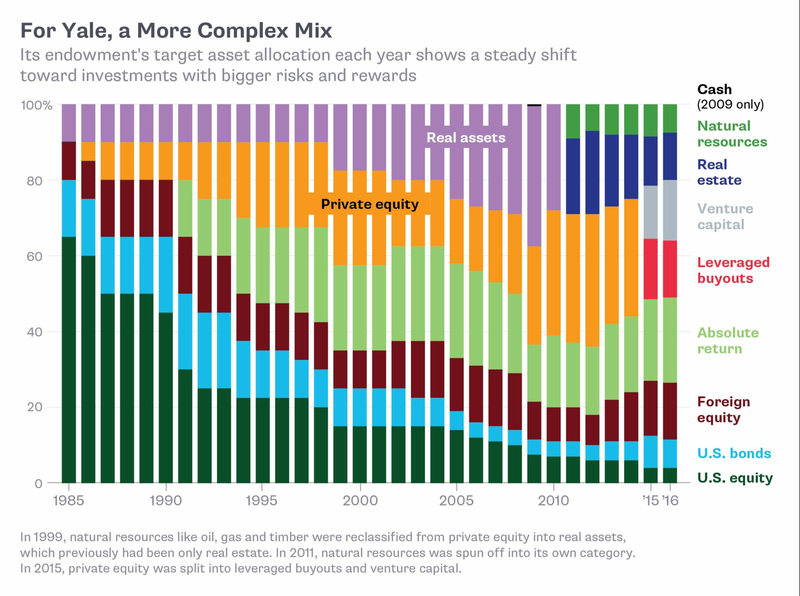 Yale’s investment strategy emphasizes long-term active management of equity-oriented, yet often illiquid assets, with more than half the fund in alternative investments. Almost a third of Yale’s 2016 allocation is in private equity, including 16.2 percent in venture capital and 14.7 percent in leveraged buyouts. About 22 percent is in absolute return with hedged-like strategies. “Performance-based compensation earned by external, active investment managers is a direct consequence of investment outperformance,’’ it said. Yeah, I get it. Some guys are just better than others at investing, and they should be compensated commensurately. The question is, are there high performers that can be had for less than 27% of your profits? Let's take a look at a theoretical blockchain focused hedge fund vs the ICODAO - from a graphical perspective. Realize that the ICODAO charges a flat fee for its services. It's not a hedge fund, so there are no performance fees, but there are certain things that it may not be able to do on its own (yet), hence has to contract out for. The fees are to cover what it takes to make this autonomous entity self sustaining. It may very well be the case that these fees will shrink over time. We don't know, we're breaking new ground here. The hedge fund fees are self explanatory. Yes, the machines are taking over! Be sure to take part in the Veritaseum Token Offering, take part in the paradigm shift! Feel free to contact me directly with any queries via the contact form in the top menu.